Good deal for a 20 litre microwave with stainless steel exterior. Excellent reviews from over 700 customers on Sainsburys website. Standard delivery is £3.95, Click & Collect is free. Half price while stocks last. What are the dimensions of the inside please? Thank you so much - my microwave was blown up last week and i missed these 20L ones first time round. This price for this microwave will often get slashed, i bought this couple of months ago and it is good..Heat Added!! Beware guys, this is stainless steel on the outside only. We bought one for our son for uni and it started to rust inside within 3 months. Not a vary big compartment either. Could not stand an ordinary jug up inside for cooking noodles my son says! Full refund from Sainsbury's though. Looks ugly tbh. £80 at original price was rip off. Not on my screen? Does it say that on checkout. bought this when it was on offer before, brilliant deal, its lasted us ages. Bought this when on offer previously as my last microwave decided to no longer heat food. Back in stock, just got one - Thanks. Does anyone know by any chance how "20L" is classed? Better off why is it measured in litres? Standard delivery is now free. poor energy rating if stats are right. can someone confirm its rated E? A microwave’s heating category is a rating from A to E, and is designed t … A microwave’s heating category is a rating from A to E, and is designed to show you how quickly or slowly your oven will heat food. 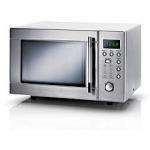 Microwaves in category E will heat your food more quickly than microwaves rated A.
just want one which is economical. found a nice one on asda for £50. Microwave broke this morning, just ordered as seems a good replacement!